Land Rover Hinsdale is proud to announce their sponsorship of the annual Wellness House Charity 5k Run and 3k Walk. The walk will take place in Hinsdale, IL on Sunday, May 4th at 8:30 a.m. at the corner of East Walnut and North County Line Road. We are lucky to have this organization in our community for those who need it, and they do great work to support those battling cancer by keeping families and supporters close. Land Rover Hinsdale is proud to announce their sponsorship of the annual Wellness House Charity 5k Run and 3k Walk. The walk will take place in Hinsdale, IL on Sunday, May 4th at 8:30 a.m. at the corner of East Walnut and North County Line Road. Land Rover Hinsdale will also have a team of employees participating in the run, to help reach the overall event fundraising goal of $425,000. The Wellness House is a community-based organization that offers resources and support at no cost for people living with cancer, including their families and loved ones. Registration to run or walk is $30.00 per participant, and all participants will receive an official long sleeved event t-shirt. The top fundraising team will win 2 round trip airline tickets to anywhere in the U.S. Those looking to register, or join a team are able to do so online here. 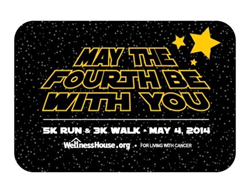 This year’s Wellness House 5k event is Star Wars themed, and is titled, “May the Fourth be With You.” Many registered teams have chosen names like “EWokers”, “Skywalkers” and “Jedi Warriors”. Even the sponsorship levels follow suit. Land Rover Hinsdale is proud to be a Jedi Knight Bronze Sponsor this year. The event will wrap up around 12:00 pm. A map of the route and more information about the Wellness House Charity Run can be found online here. Wellness House exists to improve the quality of life for those who are affected by cancer and its treatment and side effects. Whether you are diagnosed with cancer yourself or are a loved one of someone diagnosed, the Wellness House helps as you work to respond to your personal experience with cancer in the best way possible. To provide services at no charge to participants, Wellness House relies on the generosity of individuals, organizations, corporations and foundations.